Both still ciders are 6.5% average by volume and unfiltered and unpasteurised. This is a still cider which is very dry and has real bite. 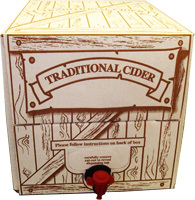 A medium still cider which is sweetened with natural sugar. Packaging is a plastic bag with a tap which has to be carefully prised from the cardboard box. Equivalent to £1.95 Per Pint!